Cardiology in the Young is devoted to cardiovascular issues affecting the young, and the older patient suffering the sequels of congenital heart disease, or other cardiac diseases acquired in childhood. The journal serves the interests of all professionals concerned with these topics. By design, the journal is international and multidisciplinary in its approach, and members of the editorial board take an active role in its mission, helping to make it the essential journal in paediatric cardiology. All aspects of paediatric cardiology are covered within the journal. The content includes original articles, brief reports, editorials, reviews, and papers devoted to continuing professional development. High-quality colour figures are published on a regular basis, and without charge to the authors. 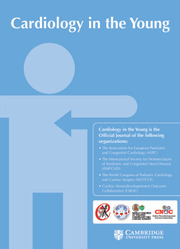 Regular supplements are published containing the abstracts of the annual meetings of the Association for European Paediatric and Congenital Cardiology, and the proceedings of the meetings organised annually by the Johns Hopkins All Children's Heart Institute, and Children's Hospital of Philadelphia. The editorial team is currently looking to expand the number of Supplements published each year. These are supplied free to subscribers.